During fall hunting season, it is convenient to make a big batch and enjoy those leftovers when you come in after a day in the field with some warm crusty bread on the side. Heat the oil in a heavy Dutch oven over medium heat and saute venison sausage, peppers, celery, onion, and garlic approx. 10 minutes, stirring frequently. Sprinkle the Cajun seasoning, pepper, and salt over the sausage and meat and stir. Add the rest of the seasonings and carefully introduce the chicken broth, tomatoes and rice. Bring to a boil, reduce heat, cover the pot and simmer for 20 minutes or until liquid is absorbed and rice is tender. Note From the Kitchen: You can substitute andouille sausage for the brats, which adds a nice kick to the dish, and some people like to add diced chicken breasts to the initial step and saute that together with the vegetables. 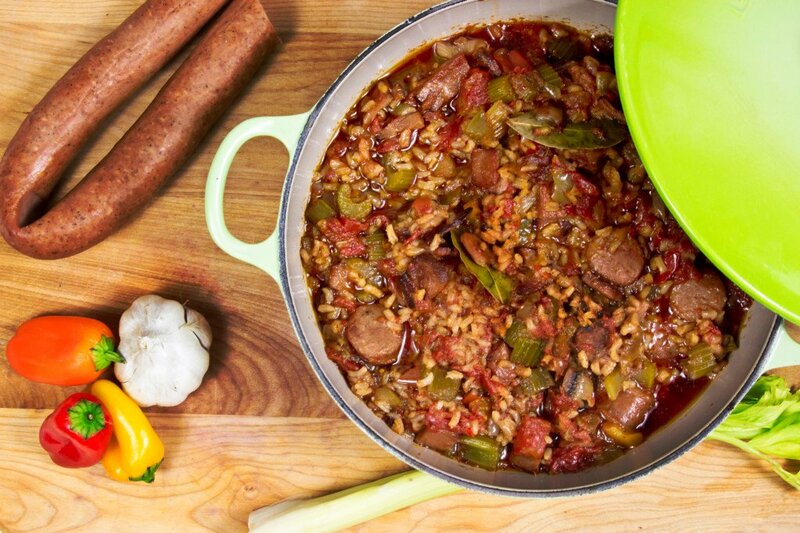 True Creole Jambalaya incorporates shrimp into the recipe.